…offering certificates co-signed by the founders of the International Trainers Academy – John Grinder, Carmen Bostic St Clair and Michael Carroll. This course is the only one available in Australia and NZ of this type. The newly developed NLP Practitioner Course is being offered as a unique small group coached training in Brisbane. The first of the series started during November 2009, and there is a series of these being offered throughout 2010 in Brisbane, on the Gold Coast and Sunshine Coast. See our Training Schedule for dates of programs throughout 2010 and our Detailed Schedule for training provided by both our organization and our associates. Our NLP Practitioner Course is practical, effective and full of profound concepts and information. The comprehensive 18-day (8 + 10 days) program brings you the working foundations and principles of NLP. You will rapidly integrate the NLP techniques you have learned into your work and personal life. Enjoy the unique coaching style of training in smaller classes which has a high facilitator to student ratio maximises your learning and ultimately your investment in the training. An NLP Practioner qualification is Internationally recognized and allows you to continue with an NLP Master Practitioner certificate at a later stage with us or another NLP Training organization. The mission of the International Trainer’s Academy (ITA) is to continually improve the quality of NLP Training on offer to the NLP public by ensuring our member Trainers have themselves received the highest quality NLP Trainers Training and testing, and that member trainers are committed to continually develop and enhance their own NLP skills. If after completing our course you choose to be certified (training and certification are separate events) by us, your certificate will carry Grinder, Bostic St Clair and Carroll’s signature. The certification process will be rigorous to ensure the quality standards set by Grinder, Bostic St Clair and Carroll are maintained. Certifying Institutes (such as Blue-Sky Transformation) enter a partnership with the ITA. 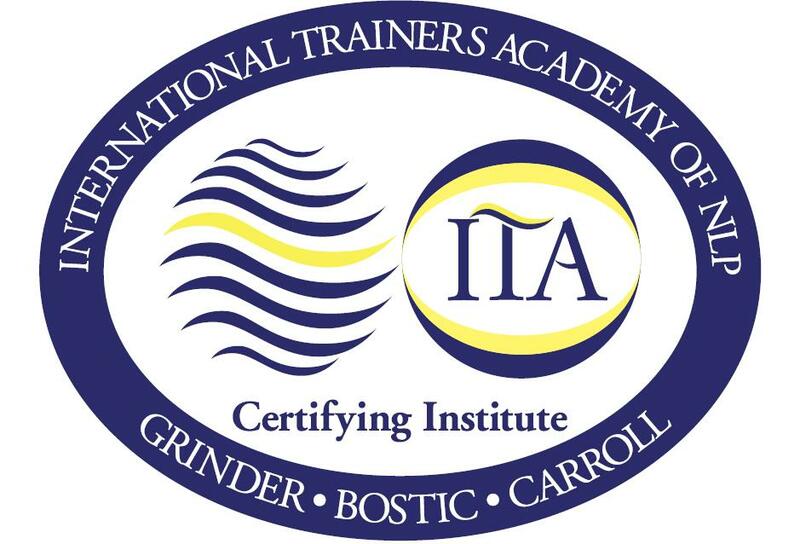 The ITA certified trainer’s signature, the co-trainer’s signature, and the signature of John Grinder, Carmen Bostic St Clair and Michael Carroll will be on the graduates’ certificates, along with the ITA Seal. “The New Code is a set of patterns developed in the mid – 80s by myself John Grinder with contributions initially by Judith Delozier and subsequently by Carmen Bostic St. Clair. The motivations for the creation of the New Code are multiple and include a recognition that the coding of patterning I accomplished with Richard Bandler in the creation of NLP contained a number of serious coding flaws. In the late 70s I noticed (JG) a significant number of NLP trained practitioners who were stunningly effective in doing change work with clients yet these same practitioners had chosen not to, or lacked the choice to, apply the patterns of NLP successfully to themselves. I therefore set out with the intention of designing a set of patterns that would both correct the coding flaws of the Classic code (roughly my collaborative work with Bandler from 1974 through 1978) that could not be effectively presented unless the presenter was congruent with self application.” From Whispering in the Wind. See also the article The Sins of the fathers for a further discussion on this topic. We are approved NLP New Code Trainers as we have attended New Code Trainers Training with John Grinder, Carmen Bostic St Clair and Michael Carroll. Approved New Code Trainers have been awarded this prestigious title based on their achievements. This is a most unique course and is leading the advancement in NLP Training. Unique Coaching format so you get maximum result from your training. Highly Qualified Trainers with international experience. Exceptional Quality and Practical Excellence. Our course meets the criteria globally for certification with additional skills, information and knowledge from world leaders in the field of NLP. Facilitated by currently practicing professional coaches and therapist who brings additional insight. All of our training content is true to the core of the essence of NLP, which is modelling, at the same time includes the latest advancements that is the New Code of NLP. See NLP Co-creator, John Grinder’s own distinctions regarding training that can be found on the International Trainers Academy website. This is the only training program in the region supported by on going, regular practice and continuous development facilities. This course also offers the ongoing training and support through the NLPCafeBrisbane. NLP Café Brisbane is an NLP practice group, which aims to help NLP Professionals to advance their skills and individuals to learn to use the tools they were born with. We train in NLP Classic Code, New Code, and some of the most up to date developments in related disciplines. Attendance at the course guarantees your support at NLPCafeBrisbane.